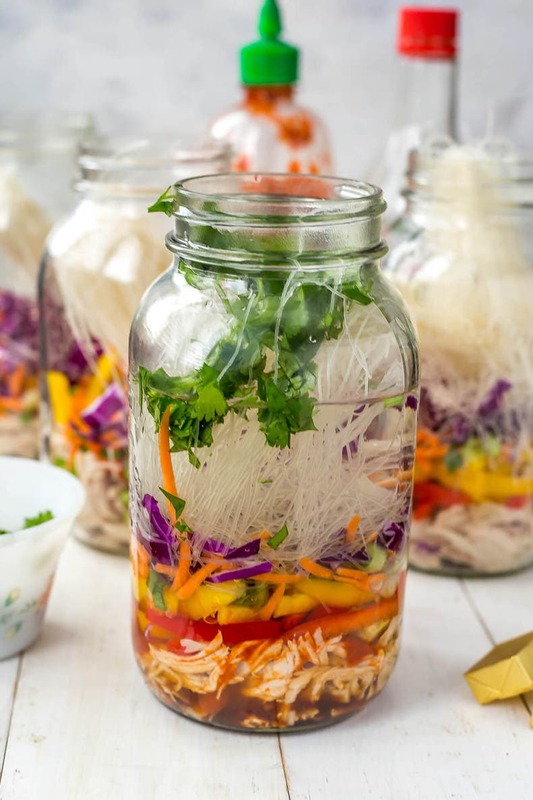 These Mason Jar Instant Noodle Soups are the perfect on-the-go work lunch and packed full of raw veggies, quick-cook vermicelli noodles & shredded chicken! Factor in work and school, and you're looking at a lot of plain, paper bag sandwiches or expensive meals out and about, seriously. Well, it's my personal belief that these Mason Jar Instant Noodles are going to change all that! I had seen ideas for these cute little soup jars elsewhere, but was skeptical of creating one myself. 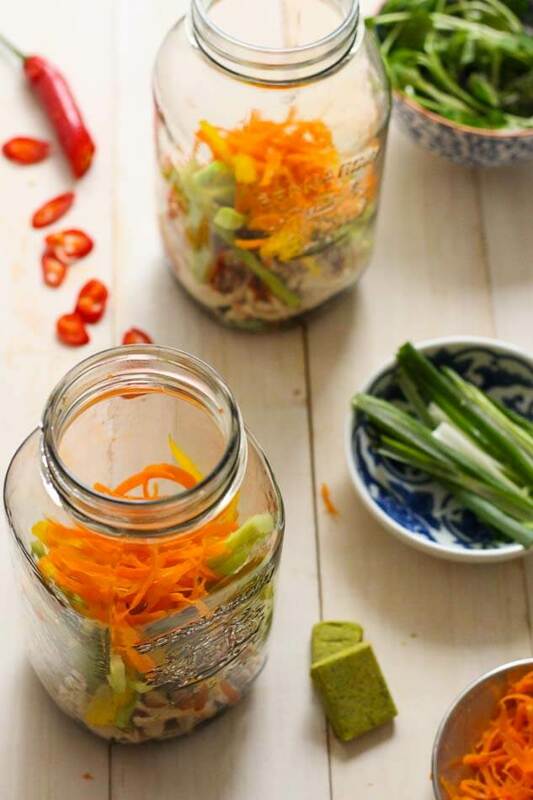 When I first started playing around with jar recipes a few years ago I totally had no idea what I was doing, but three years later and these Mason Jar Instant Noodles are still a go-to lunch recipe of mine come summer or winter. They're just so easy and delicious, and something I keep going back to time and time again when I run out of ideas for work week lunches. 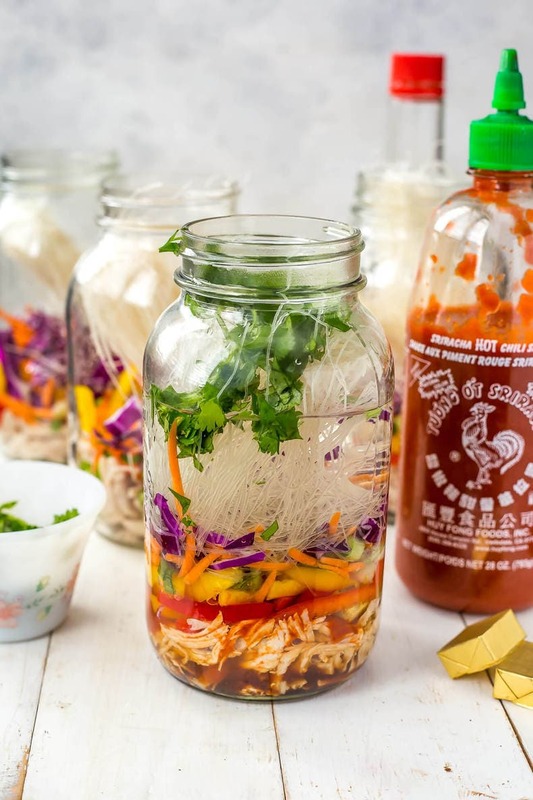 These healthy, no-preservative Mason Jar Instant Noodles with shredded chicken, hot sauce, vermicelli and veggies are beyond easy to make and are the perfect on-the-go lunch for school, work, or anything else you've got going on in your busy day. You could seriously eat these all five days of the week – all you have to do is cook your chicken ahead of time on Sunday, pick whatever vegetables you've got lying around, and go nuts! Or if you're anything like me and you have leftovers out the ying yang, you'll probably already have some leftover chicken to use up and this is the perfect recipe for that! 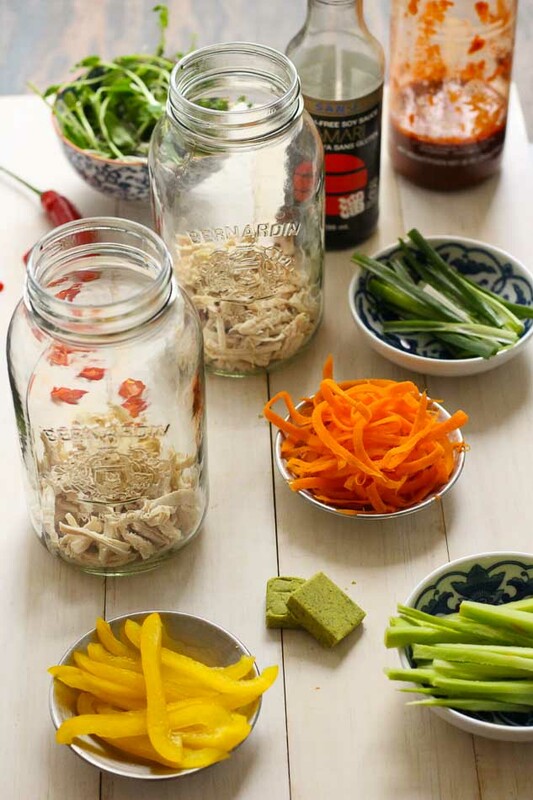 These Mason Jar Instant Noodles are perfect for reviving old, dry leftover chicken because the broth soaks into the pulled chicken and instantly removes that sort of dry aftertaste and texture you get with leftover chicken. And trust me, I'm a picky eater and I'm telling you I'm impressed with this recipe. I think I've found a magic instant noodle broth, seriously. 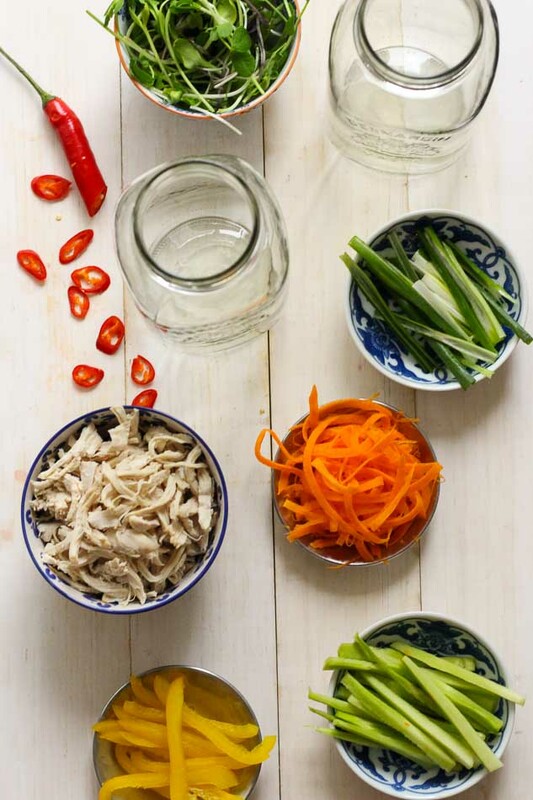 The “instant” broth is remarkably simple and I still can't get over the shock of how delicious it really is: just drizzle some soy sauce, Sriracha hot sauce and lime juice over the shredded chicken so that it has time to marinate. Let it sit up to 5 days in the fridge along with all the veggies, and if you can, use fresh herbs like cilantro or basil. 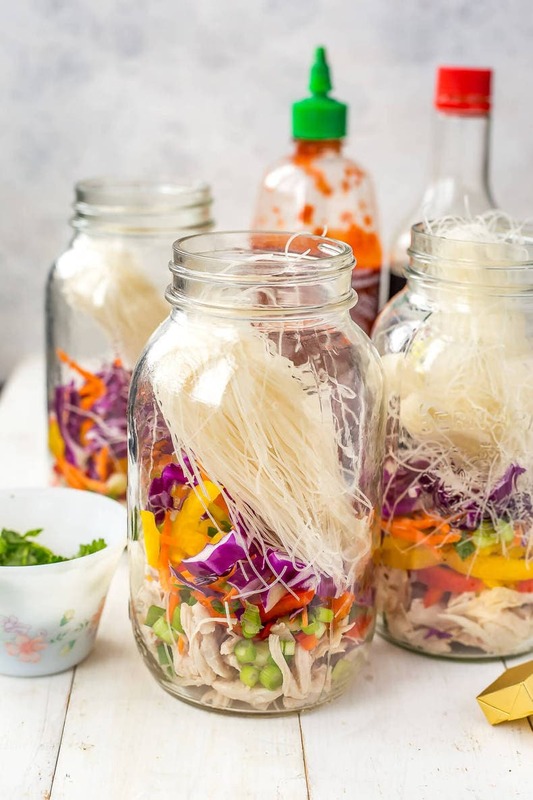 From there, layer in your fave vegetables, add a bouillon cube and some quick cooking vermicelli rice noodles and that's really all there is to it! I don't fill my mason jar up all the way (I only do it about half to two-thirds full), so before you go all crazy with it know that you want to leave a little bit of room so that everything fits in a big bowl. I mostly just use the mason jars as transporting containers until I can get myself to a kettle. Mason jars are actually sooooo handy to keep on hand by the way. You can get them pretty much everywhere and I have come to really prefer them over plastic tupperware containers just for the layering aspect. Keep your meat and sauce in the bottom so the veggies stay fresh. And they take up way less fridge space because they're vertical. I don't know about you, but I had SUCH a great holiday with family and friends. It was so nice to kick back and relax and step out of routine for a little bit. Sometimes you need to step away from your routine to appreciate it in the end, and get back to doing work that you love while recharged and refreshed. I am proud, however, that I was able to stick to a fairly clean diet over the course of the break, and look forward to developing more super easy and healthy recipes like this for the New Year ahead. There's nothing better than something so simple being the reason you're able to stay on track with a healthy diet. Make these on a Sunday, and pop 'em in the fridge for the rest of the week. I just suggest bringing a bowl wherever you're off to though so that the soup is easier to eat, but other than that this recipe is super low maintenance. 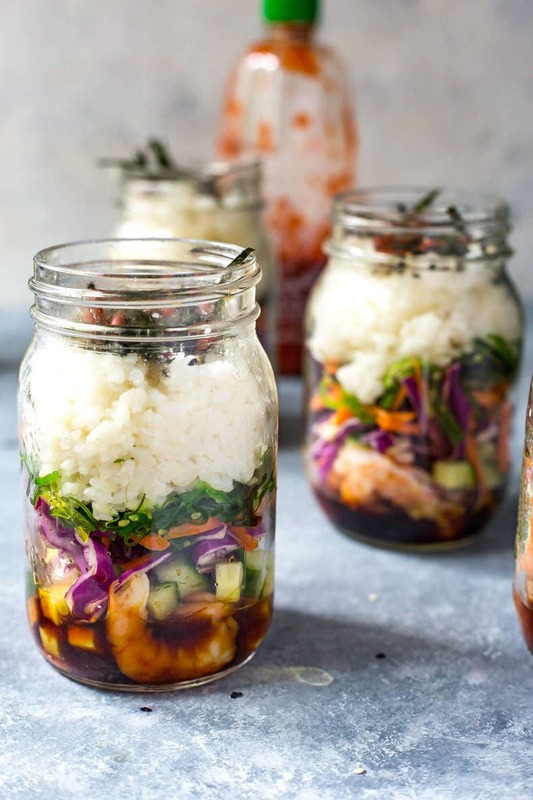 You can always customize these Mason Jar Instant Noodles by adding different seasonal vegetables, different herbs, and even adding different flavourings like fish sauce or miso paste. It really all just depends on what you have on hand, and what you're craving! 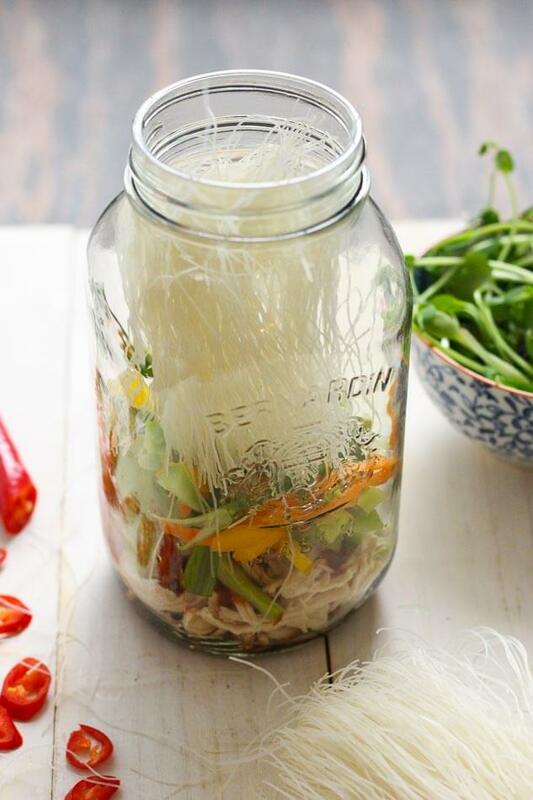 Will you be trying my Mason Jar Instant Noodles recipe? If you do be sure to tag me on Instagram and Twitter so I can see your custom creations!!! These are the mason jars I use! These are the vermicelli noodles I buy. This is the brand of tamari I like, and I love this low-sodium soy sauce! To shred chicken, boil in a large pot of hot water for 12-15 minutes until chicken is cooked through. Pull apart with your hands or with a fork once cooled. 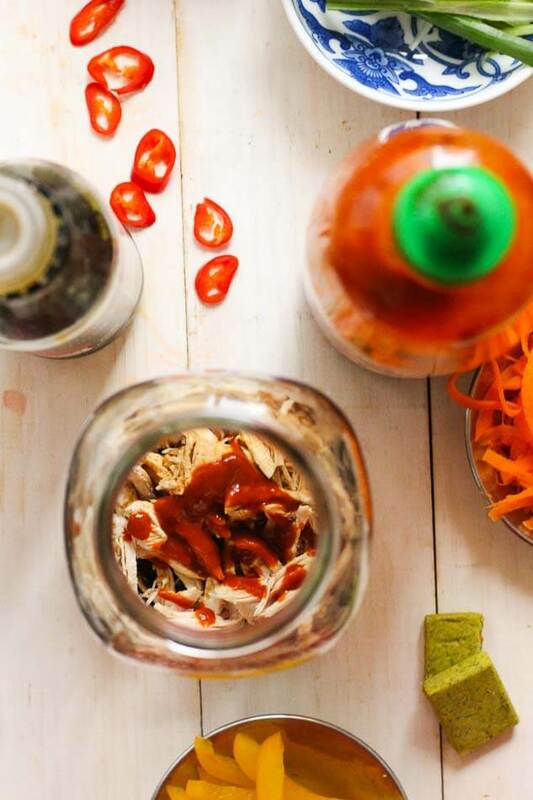 Divide the shredded chicken into each mason jar evenly, then add soy sauce, Sriracha and lime juice. Layer in vegetables, then drop in bouillon cubes. Sprinkle in chili pepper if desired. Finally, finish with vermicelli noodles and keep in fridge until ready to eat. 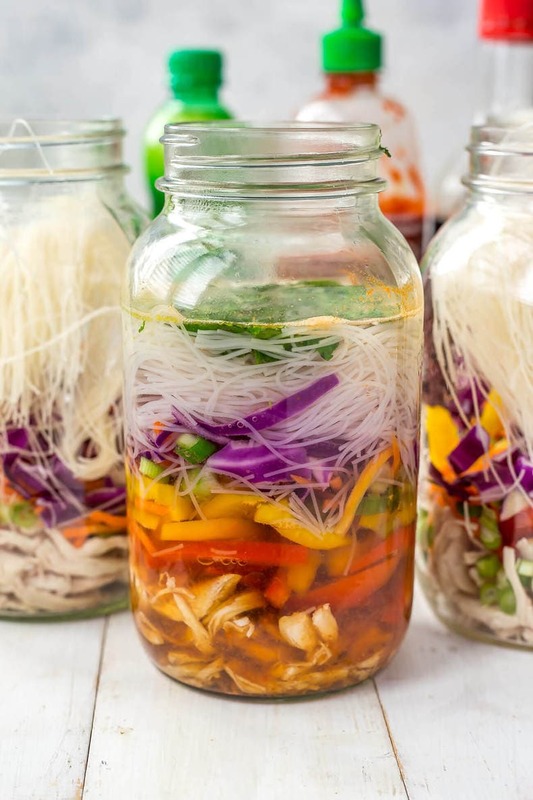 Pour boiling water up to about two-thirds of the jar and stir contents, making sure to dissolve bouillon cube completely and saturate noodles. 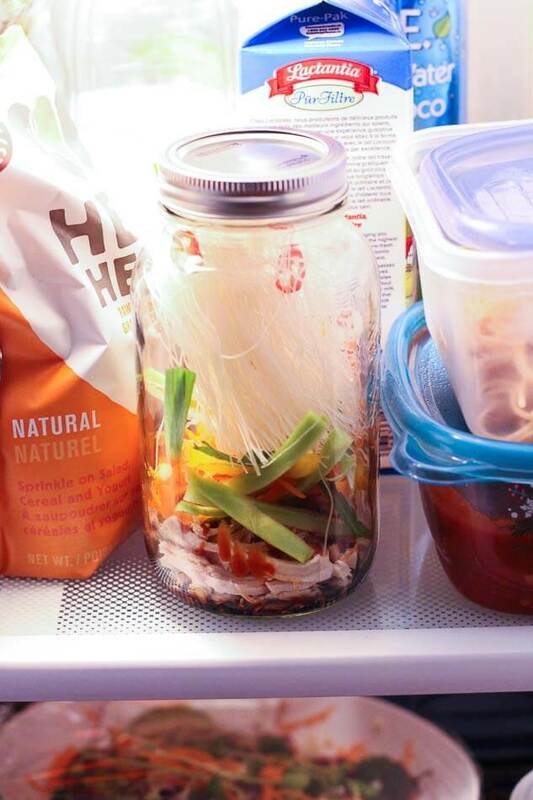 Microwave jar for 1-2 minutes if you're looking to eat the noodles right away. Pour contents into large bowl when ready to eat (should be within 5 minutes of pouring boiling water) and eat right away! Love this idea for lunch during the week. Perfecto! Great idea, thanks for sharing. I used some mini jars for personal servings and sent a half dozen to work and surprised the crew at lunch ???? I LOVE noodle jars! I make them all winter long for my husband to take to work. So handy, delicious, and healthy! 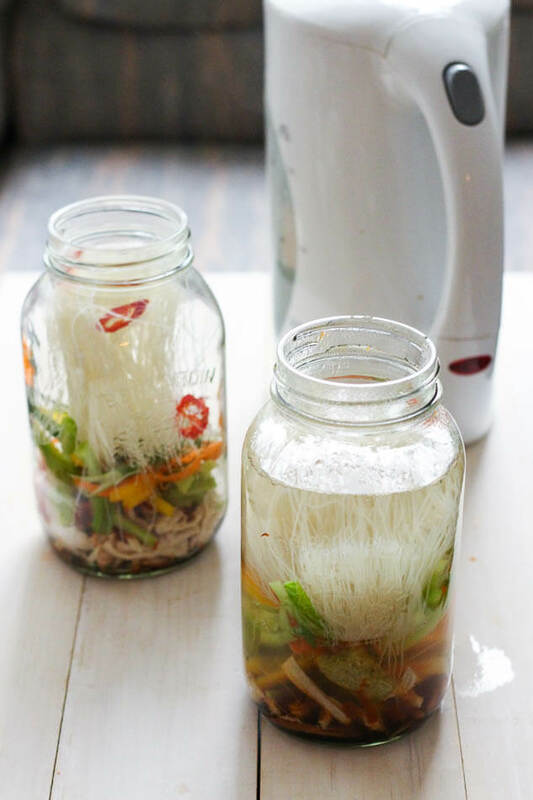 I’m loving this idea of instant noodle jar and so tempted to make it right away! Thanks Priya!! If you make it let me know how it turns out! Yumms 😀 love the idea… its meal on the go. This is a really fun idea for lunch. I loved the photography too. This is such a great recipe! Do you use rice vermicelli or the pasta kind? And do you have an idea on what I could sub if I want to reduce the refined carbs? Maybe other veggies or shredded cabbage, I’ll brainstorm! But this looks just delicious! Hey Sarah! I use rice vermicelli – if you’re looking to reduce carbs there are usually other kinds of noodles in Asian markets (or even your local grocery store depending on how big its international section is) that are made from sweet potato starch or green bean starch. If you would prefer to opt out of having any kind of starch altogether you could sub in some extra veggies like you mentioned (red/green cabbage would be delish!!) 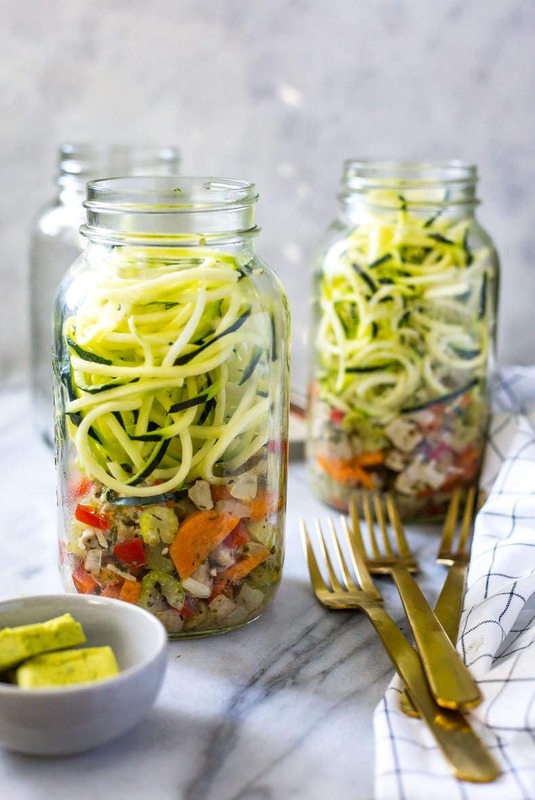 or you could use a spiralizer to create some zucchini noodles, etc. Worst comes to worst you could always just include a TINY bit of the rice noodles and instead use the whole chicken breast in one mason jar as opposed to dividing it in both jars. 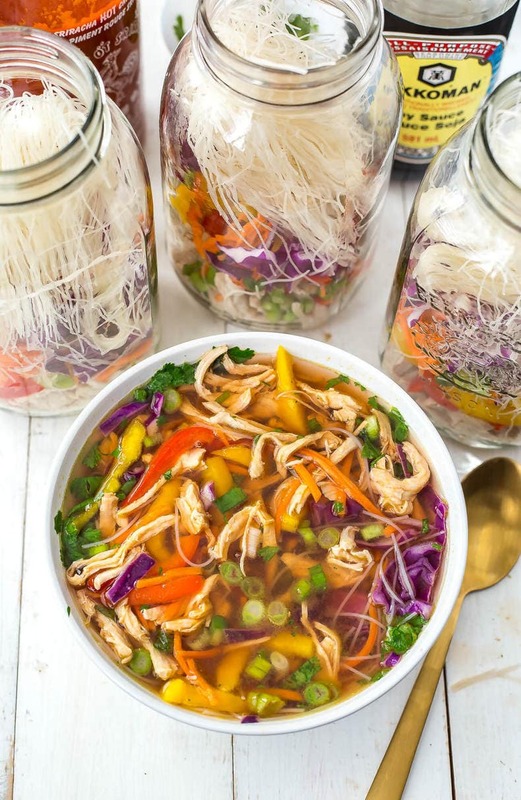 What I honestly love about this recipe is how easy it is to change it up – I’m on a high protein, low carb diet right now myself so I just dumped in double the chicken the recipe calls for and tons of veggies (I made this the other day – ha), then included a teensy tiny bit of vermicelli noodles made with green bean starch. What is the capacity of the mason jars please? The mason jars I use hold up to 1L! I will update this in the recipe! When you pour boiling water into the mason jar, doesn’t it crack? Do you recommend any other jars that won’t crack with the temperature change? No it definitely doesn’t! People use mason jars in canning and pickling all the time which involves boiling the jars to seal them. I have also made this recipe several times without issue as well. Mason jars are by far the safest thing you can use! Hi Taylor, quick question about the recipe–it calls for 1 chicken breast then the instructions tell you to layer in half a chicken breast. Does the recipe only use half a chicken breast or is the other half supposed to be added somewhere in the layers/process? Thanks for clarifying! Hi Taylor – I understand that you divide the chicken between 2 jars, but do you add half the amount of soy, sriacha and bouillion to each jar as well – 1 tsp soy and sriacha, 1/2 tsp lime to each jar? Or do you add the recipe’s measurements to each jar? Just made some of these with my office mates today. Great idea! Cheers! These look fabulous and I’ve been making a similar meal at home, but need a take to work version. Thx! If I may suggest, try using miso paste instead bullion cubes. I agree with LaRee on bullion cubes. If you can, find an unpasteurized miso paste , it’s full of probiotics for healthy gut flora and has much better flavour. Any good whole food store will carry in the refrigerated section. I highly recommend Traditional Miso which is locally made in southern Ontario. Just make sure the water isn’t boiling when you add it to your mason jar. My suggestion is to boil the kettle and then wait a minute or so for the temperature to drop below boiling and then add the water to the mason jar. Boiling water will kill the good bacteria in the miso. I’d suggest a heaping tablespoon to start and then adjust to your own taste. Your jars are 1L which is what I’m basing it on. Enjoy! Well – I must be doing something wrong. 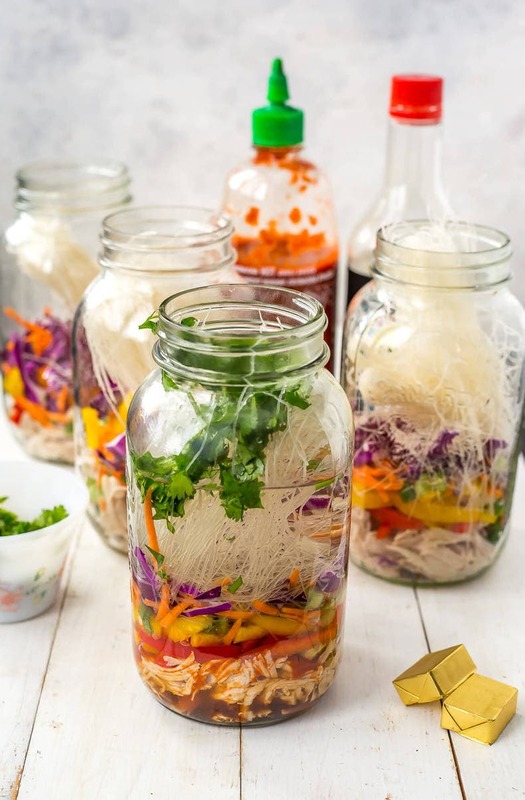 Those rice vermicelli noodles do not cook in 2-3 minutes. Or even 5 minutes. Most packages suggest you soak them for 10 or more minutes. Others have you boil them and let them sit. I have tried using them for these Mason Jar Instant Soups and the results is not eatable. Putting them in uncooked and then trying it after 5 minutes leads to crunch in noodles that should be cooked. Waiting longer – everything starts to taste mealy and starchy. Yuck. Can you tell me how to get the noodles to actually cook correctly? You’re using bean thread vermicelli noodles, not the regular rice ones. I think the ones she’s talking about above take way longer to cook and boil on the stove for a number of minutes. She could soak them though. Yeah if you look at the vermicelli noodles she supposedly buys, the instructions say to presoak them for 10-15 minutes before cooking them in boiling water. If you don’t presoak you have to boil them for 10-12 minutes. So it’s doubtful she’s cooking them for 3 (count em) minutes. Regular instant ramen has to cook longer than that. Taylor, have you tried any experiments in making the broth/flavour base/paste etc from scratch without using say something like bouillon cubes etc so that way, one could make the entire DIY instant noodles without anything premade whatsoever. Hi Peter! Unfortunately no I have not tried this – I know it’s ideal to have everything in a recipe made from scratch but without making a liquid stock by hand (which would take hours in the kitchen), I don’t see how you could make a similar equivalent. At least it’s not something I specialize in – sorry about this! I have found recipes for ‘Homemade Instant Bouillon Cubes’ for example as i thought that would be the best place to start as Bouillon Cubes are mentioned a lot in these DIY instant noodle recipes. That would be so cool to try! I wish I could help more on this end but I’ve never tried making the homemade bouillon/stock cubes before. May be something for me to experiment with myself and hopefully provide a recipe in the future. Doing a quick Google search myself it looks like you can blend up a bunch of different veggies (carrots, celery, onion, garlic, leeks, parsley, etc) but then there is still a ton of salt that needs adding. See this recipe here, over 3 tbsp among 16 cubes it looks like: http://paleogrubs.com/homemade-instant-bouillon-cubes. I think no matter how you slice it there’s going to be a ton of sodium in one BUT at least you can maybe make them less processed. Here’s another recipe that uses actual homemade stock: http://www.simplebites.net/homemade-bouillon-cubes/. I initially suggested the store-bought bouillon cubes to save time since this is a meal prep recipe and most people just don’t have the time to do a project like this, but it could be worth investigating/experimenting on my own because if something can be batch made like this, it may be a better way to enjoy a meal prep soup 🙂 Thanks for the feedback Peter and sorry I couldn’t be of more immediate help! That’s the link I currently have open in my chrome tabs and was the recipe i mentioned. TBH, I only just saw the ‘3 ½ tbsp salt’ on the ingredients list…ouch! “Saltneys salt alternative is a 100% salt alternative that is made with completely natural ingredients, is virtually sodium free, high in natural potassium and has all the flavour of regular table salt and sea salt. Generally a good rating apart from a couple of people who say it doesn’t taste great (similar comments you expect to find for sugar alternatives too). ’19 natural salt alternatives’ search turned up some interesting results too! And Taylor, you have been of super help and I thank you. Im so excited to try this! Just made it tonight for myself using sealable jars (not mason, the ones with the pop top lid) but honestly, putting them together took all of 15 min for 6 and now I have lunches for the week. I switched out the siracha for a pepper/garlic hot sauce, added a bit of pepper and tried it with a thicker noodle – I’d bought vermicelli but also a standard higher quality ramen and udon noodles. Thanks ! what a great grab and go for lunch.